How Does Coconut Oil Help Prevent Hair Loss? Coconut oil has been an age old remedy for all kinds of hair problems. From dandruff to dry hair, it’s a one stop solution for all issues of the hair. It conditions hair and improves the health of not only the cuticle, but also the scalp because of its antibacterial, antimicrobial, and emollient properties (1). This, added to its penetrative properties, makes it a perfect ingredient for hair care (2). Because of the oil’s ability to manage most hair problems, it is an efficient remedy for hair fall as well. Below are the different ways in which coconut oil helps your hair and keeps it healthy. The lauric acid present in coconut oil is highly antibacterial, which makes it perfect for maintaining the health of your scalp. It keeps the hair follicles healthy by keeping the bacteria at bay (3). 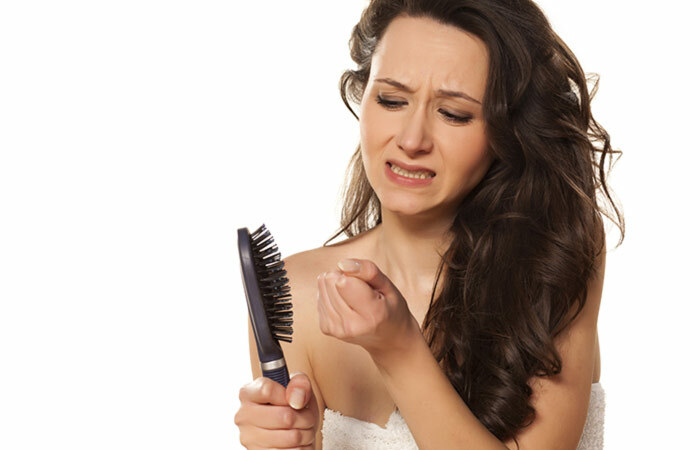 Hygral fatigue, or the swelling of the hair shaft, happens when excess moisture is absorbed into the cuticle, causing frizz as the cuticle dries. 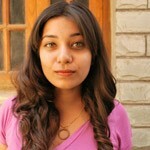 This especially happens when it is humid or when you shampoo your hair too much. Coconut oil counters this as its oily nature seals in the required moisture in your hair shaft while keeping excess external moisture out. Coconut oil penetrates deep into your hair shaft and keeps the protein locked in. Since the oil is a triglyceride of lauric acid, it has a high affinity for proteins (4). Hence, with the topical application of coconut oil, protein loss is prevented. Coconut oil is a great source of nutrients and antioxidants that are good for your hair. It keeps your hair well-nourished. It gets rid of dandruff and promotes hair growth, making your hair look thick and healthy. 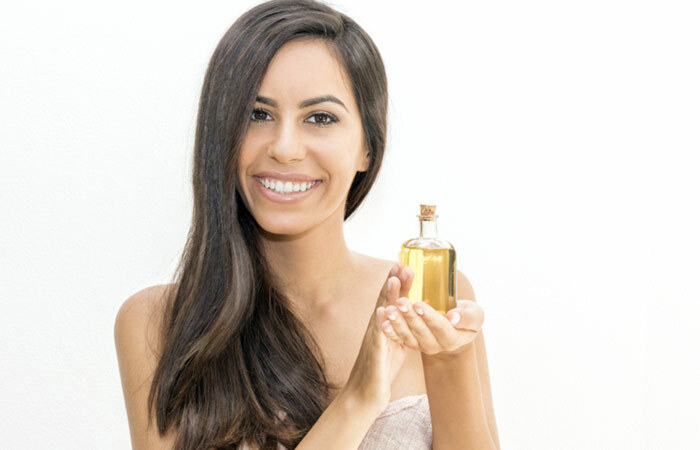 The oil keeps your hair from getting dehydrated. It is a great natural conditioner that keeps the moisture in your hair locked in. Your hair is constantly thirsty for moisture, so using coconut oil is a good way to keep it hydrated. The antibacterial and antimicrobial properties of coconut oil make it a perfect solution that prevents viral and bacterial infections. This even keeps issues such as dandruff and lice at bay. Massaging coconut oil into your scalp will improve blood circulation and ensure that the nutrients in your blood reach and nourish your follicles, ensuring that your hair grows out healthy and thick. Coconut oil is a great ingredient to use in the summers, or when your scalp is irritated, as it is a coolant. The cooling nature soothes any sores or irritation and keeps your hair from feeling too sticky in the summer. While store-bought commercial conditioners coat your hair with chemicals and leave it feeling smooth and conditioned on the surface, it does little to improve the health of your hair. Coconut oil works from the inside to lock the moisture in your hair for longer, improving the health of your hair. While there are many causes for dandruff, ranging from skin conditions to fungal growth, coconut oil can soothe this chronic problem and ease its symptoms. It works especially well for a dry scalp that is flaking, as it moisturizes the scalp and restores its health. How To Use Coconut Oil For Hair Growth? 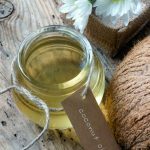 There are many ways in which you can use coconut oil for hair growth, we have listed the five most efficient ways on how to use coconut oil for hair loss and promote hair growth. Wash your hair with shampoo. Skip conditioning. Let it air dry. 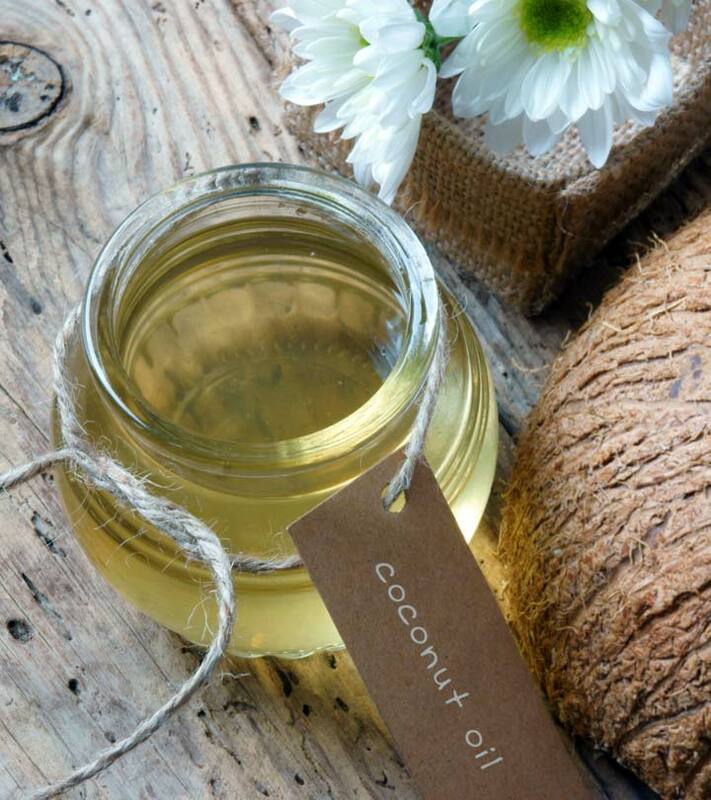 Heat the coconut oil by placing it in a bowl and then letting that bowl sit in a bigger one that has hot water. Once your hair is completely dry, start applying coconut oil to your hair and massage it into your scalp. Comb your hair to ensure that the coconut oil has coated every strand and then put your hair up. Cover your hair with a shower cap and let it sit for 45 minutes to an hour. You can also leave it in overnight. Rinse with shampoo and condition. Instead of conditioning, you can also apply a tiny bit of the oil to the ends of your hair post-wash.
Heat 1 tablespoon of coconut oil in a bowl so that it melts. Once it is at room temperature, apply a tiny amount to the tips of your hair. Start detangling your hair with your comb. Heat the coconut oil until it has melted. At night, on freshly washed and dried scalp, start massaging the coconut oil. Once you have covered your entire scalp, wrap your head in a towel and go to sleep. Wash off the oil with shampoo and condition. Melt the coconut oil and coat your hair with it liberally. Comb your hair out for even coverage. Mix your colorant and developer in the mixing bowl. Apply the colorant mixture over your oiled hair and let it sit for the recommended amount of time. Once your hair is dry, wrap your head in a towel to let to color further set. Sleep with the towel on. Mix the coconut oil in a spray bottle filled with water. Shake the bottle and spritz it over your hair. Comb your hair out for even coverage. You can use this spritz multiple times throughout the day. The oil will protect your hair from sun damage. Not getting a sufficient amount of nutrients can have a negative impact on the health of your hair, leading to hair loss. Over consuming vitamin A, or not getting enough iron can trigger a response in the form of hair loss (5, 6). Since most of your hair is made up of protein, a lack of it can also result in hair fall. Dihydrotestosterone or DHT, which is a more potent form of the male hormone testosterone, is a cause for hair loss in women (7). The lack of estrogen can also result in improper hair growth as the female hormone stimulates growth (8). Fungal infections such as ringworm, folliculitis, piedra, Demodex folliculorum, and seborrheic dermatitis are conditions of the scalp which result in irritation, sometimes inflammation, and ultimately hair loss. Chemically treating your hair with relaxers that alter its structure leave your hair damaged with issues like frizz, dandruff, graying, weak hair, and hair loss (9). Chemicals that alter the color of your hair can be a big factor for hair loss. One case study found that a 41-year-old woman experienced 90% hair loss after she used a hair dye (10). Prescription medicine and over-the-counter drugs can sometimes trigger hair loss, but the symptoms usually stop when you stop taking the medicines. Drugs made of high blood pressure and high cholesterol are usually the ones that cause these problems. Stress can cause a type of temporary hair loss known as telogen effluvium. Your hair has three phases of growth – anagen, catagen, and telogen. The telogen phase is the shedding period where the hair falls off, and a brand new hair replaces it. Stress can cause the hair to shift from the anagen phase right to the telogen phase, causing hair loss. While this usually happens with physical stress, emotional stress can worsen a hair loss problem. Losing weight rapidly can be stressful to your body. This stress causes telogen effluvium, which results in hair loss. The stress is caused due to the sudden change in diet and physical activity. Hair loss can be genetic. If you have a history of hair loss in your family, it is likely that you too will start losing hair. Heredity is a big defining factor when it comes to the health of your hair. As you grow older, the rate at which your nails and hair grow slows down. Hair starts losing pigment, and grows out thin and brittle. Almost everyone experiences some hair loss as they grow old with some women losing so much hair that parts of their scalp become visible. There is a reason why coconut oil is used by women all around the world for hair care. If you have issues of hair loss, use this effective ingredient to tackle the problem and promote hair growth. Is coconut oil part of your hair care regime? Tell us about your experience with it in the comments section below.